The third instalment in the NetEnt Rocks music trilogy has finally arrived. Crank up your speakers, pour yourself a whiskey and join rock legends Motörhead, lead by the recently deceased Lemmy Kilmister, in a music fuelled online pokies experience unlike any you’ll find in a land based casino. 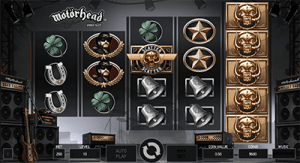 Motörhead, along with the other music themed pokies in the NetEnt Rocks collection, can be found at all our recommended NetEnt pokies sites. Sign up using the table above to claim some exclusive welcome bonuses like matched deposits and free spins. Motörhead is available for instant-play, with no downloads required. The Motörhead pokies game is so heavily influenced by music you’d be doing this game a great injustice to play without the sound on, so grab your headphones or crank up your computer volume and get ready to enjoy the ride. The game gets you straight into the rock n roll spirit with a live video intro of the legendary band as they slay on stage to yet another packed, beer soaked crowd. A warning is also issued as this game features flashing strobe lights which may cause sensitivity to epileptics. If you want to listen to the Motörhead soundtrack as you play, just switch on the ‘Rock Mode’ button otherwise you can still enjoy this game without the music if Motörhead really isn’t your cup of tea. The soundtrack includes the hit songs Ace of Spades, Iron Fist, Killed by Death and Overkill. Motörhead is a five-reel game containing the unusual number of 76 fixed paylines. Once the game loads, all you need to do is select the size of your bet. Use the arrows at the bottom of the reels to select your bet level and coin value, with minimum bets starting from just $0.20 and going as high as a max bet of $200. The standard symbols in Motörhead are nothing out of the ordinary, using classic slot symbols designed to have an old-school punk vibe. There’s cherries, liberty bells, lucky sevens, four leaf clovers, horseshoes, nautical stars and then for good measure, the legendary Lenny himself. It’s the bonus features which give you the real winning potential, with several unique bonus rounds bringing the chance for some big wins. Wild symbol – The games wild is the Ace of Spades symbol, which substitutes all other symbols to form a winning combination except for scatters. Scatter symbol – The satanic looking scatter symbol is responsible for triggering the free spins bonus. Mystery Reels feature – During every spin, one entire reel becomes a Mystery Reel. If mystery symbols remain on the reel once the spin has come to a stop, all mystery symbols transform into one random symbol. Bomber feature – the Bomber feature is randomly triggered during the main game, adding a number of bombs which contain a cluster of mystery symbols to the reels to create a minimum of 10 overlay mystery symbols. Once each bomb has generated the mystery overlay symbols, gameplay continues the same way it does during the Mystery Reels feature. Free spins – An appearance of three or more scatter symbols anywhere on reels three, four or five during the main game trigger 10 free spins. During the free spins bonus, the Mystery Reels consist of both mystery symbols and wild symbols. 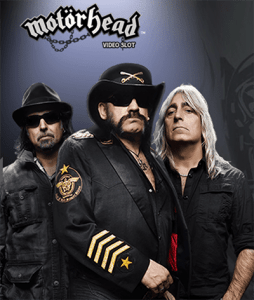 Motörhead can be found at a majority of the Internet’s leading casinos for instant-play directly over your Web browser. Safe deposits are available using instant deposit methods like Visa, MasterCard, Neteller, Skrill, and Paysafecard. To play at the most trustworthy sites offering the best welcome bonuses for new players, we recommend the leading online casinos listed in our casino table above. Motörhead is also available for mobile play, and is available for all data enabled smartphone and tablet models including Apple iOS, Android and Windows Phone. If you’re a fan of Motörhead the band, there’s no doubt you’ll absolutely love Motörhead the pokies game. It’s exciting, it’s loud and it captures the hard rock essence and raw masculinity of the band. 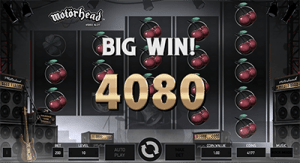 The addition of some unique bonus features adds further credibility to NetEnt’s already incredible collection of online slot games, and we love the game uses real concert footage. Although this is a truly excellent game, in our opinion it’s probably the least impressive of the three NetEnt Rocks titles, with earlier releases Guns N’ Roses and Jimi Hendrix overshadowing Motörhead. Play all three games at our recommended casinos and decide for yourself which is your favourite. Find out how you can pocket a 40 per cent deposit match up to $100 every Wednesday night at SlotsMillion.com. Play select new pokies games at Joe Fortune this February to win free spins and cash bonuses. Get 20 extra spins every time you make a deposit between 11am and 1pm, Monday to Friday at SlotsMillion.com. Joe Fortune is running not one, not two, but eight online pokies tournaments every night of the week, each with a top prize of $300.